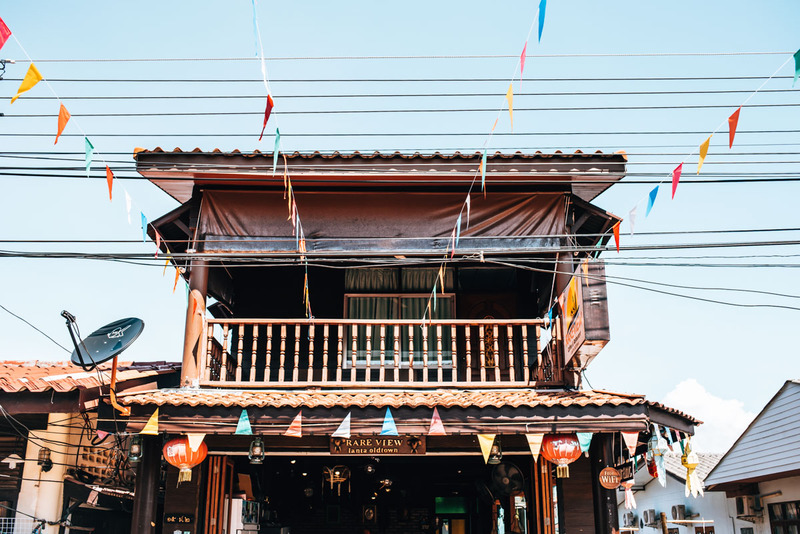 We felt at home from the very first moment we set foot on this quaint cozy island of Koh Lanta. 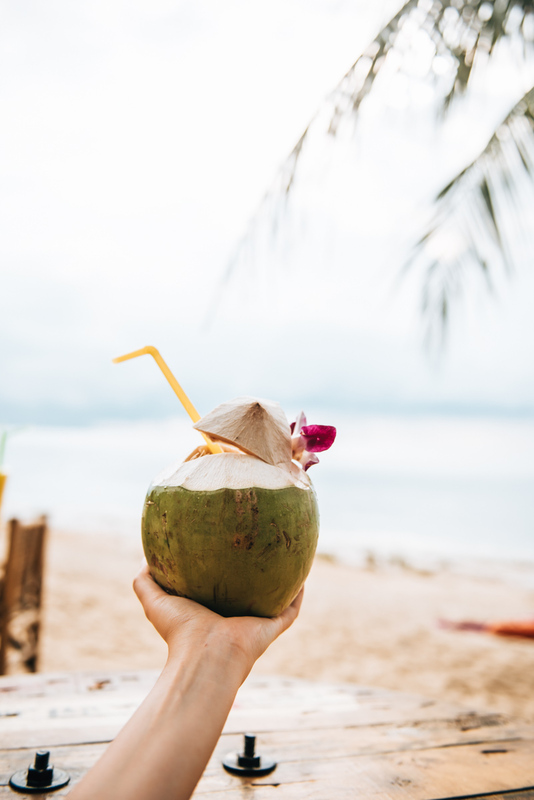 Let’s not go into how crowded some of the islands in Thailand can be, however, Koh Lanta managed to retain that authentic Thai culture and flair, which is what we love about it. 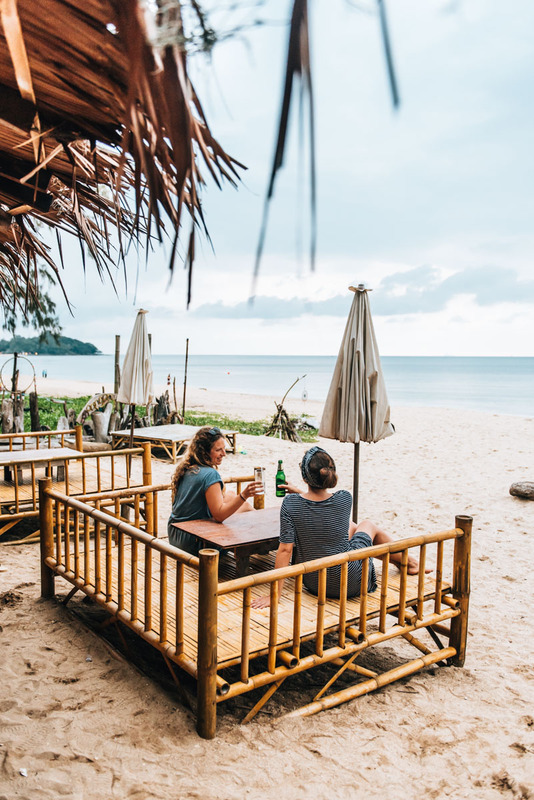 Koh Lanta is well sized for an island: big enough to explore on your own and constantly discovering new places, yet small enough to give you a feel of their local island culture. 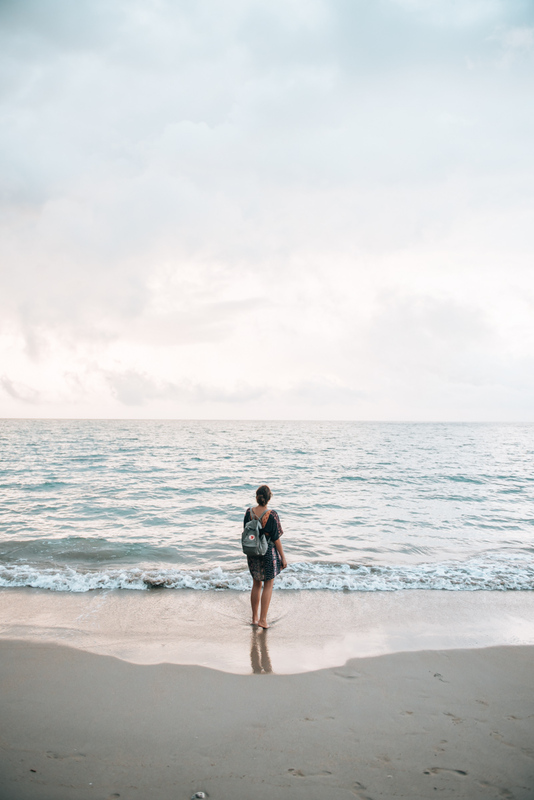 In this blog article, we’ll share our own personal opinions, tips and what to expect when exploring this lovely island of Koh Lanta. Koh Lanta belongs to the province of Krabi and is located on the west coast of Thailand, not far from the mainland (which you can reach with a vehicle ferry, but more on that later). The island actually consists of two islands: Koh Lanta Yai (southern island) and Koh Lanta Noi (northern island). In fact, 99% of the island is in the southern part, as this is the section developed for tourism. What did we like about Koh Lanta? 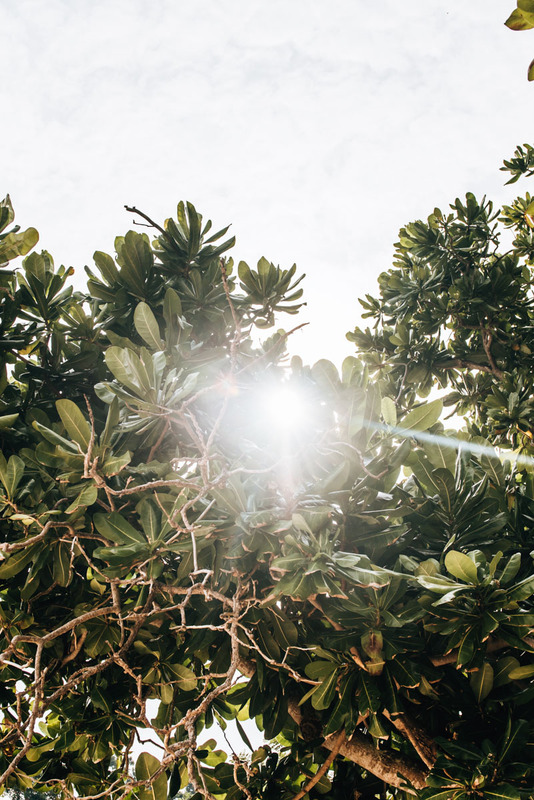 It was the mix of rolling hills, lush scenery and quiet beaches that captured us. There also exists a small Old Town, which makes for a great side trip. 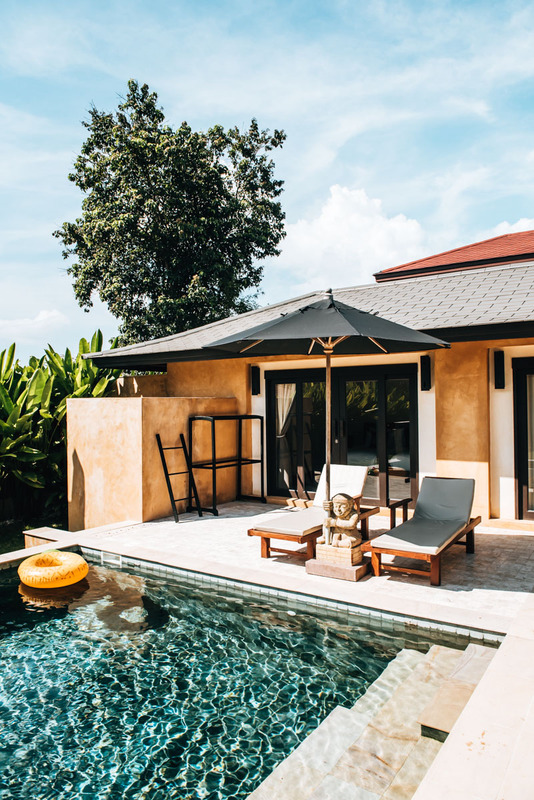 In short: Koh Lanta has the perfect combination of everything we consider essential for an island vacation. 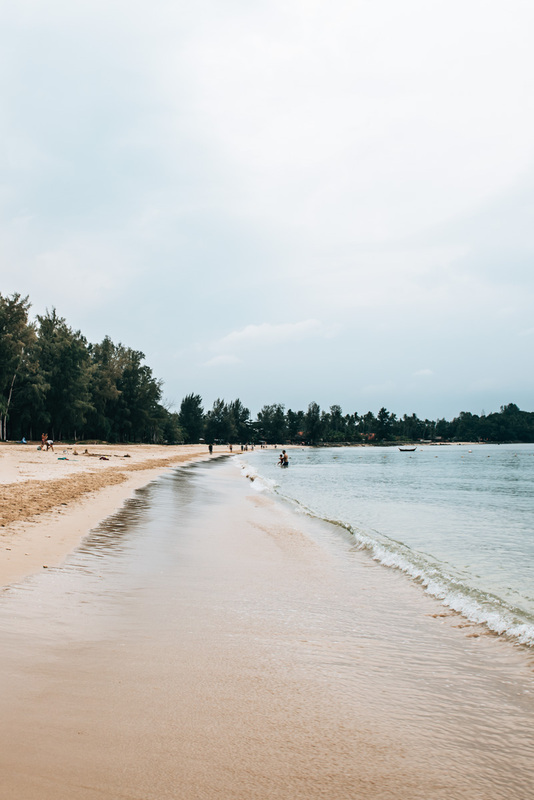 Even though Koh Phangan is still our favourite Thai island, Koh Lanta left a really great impression on us. Who is this island best suited for? 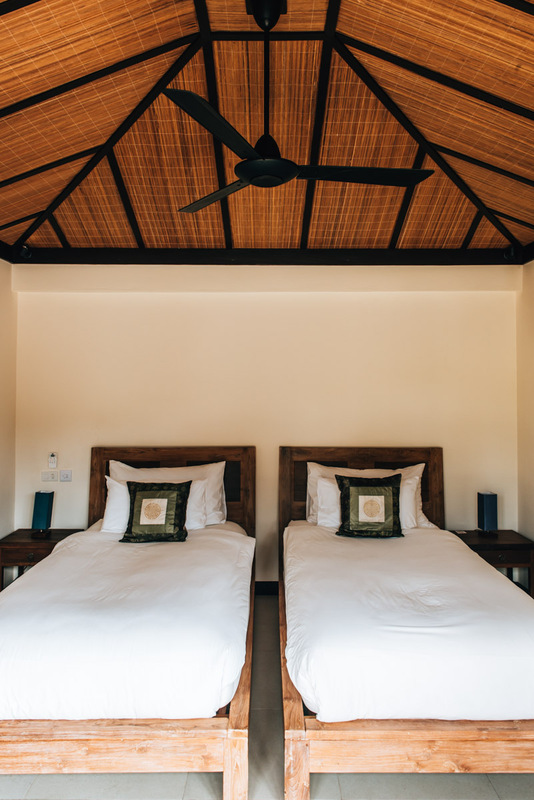 Koh Lanta is especially popular with young families and couples. This is because the island is very quiet and cozy. Party tourists found in places like Koh Samui or Phuket are, thankfully, not found here. But that does not mean that Koh Lanta is lifeless. You can find many beach bars as well as regular beach parties in various places. Even during the day, most of the beach sections are very quiet – unlike the main beaches on Koh Samui for example. As for hotels, those large franchised hotels are also seldom seen. Even in peak season, the beaches here were rather empty. Nothing was crowded. Speaking of beaches: Most of the beaches on Koh Lanta are very shallow – ideal for children. 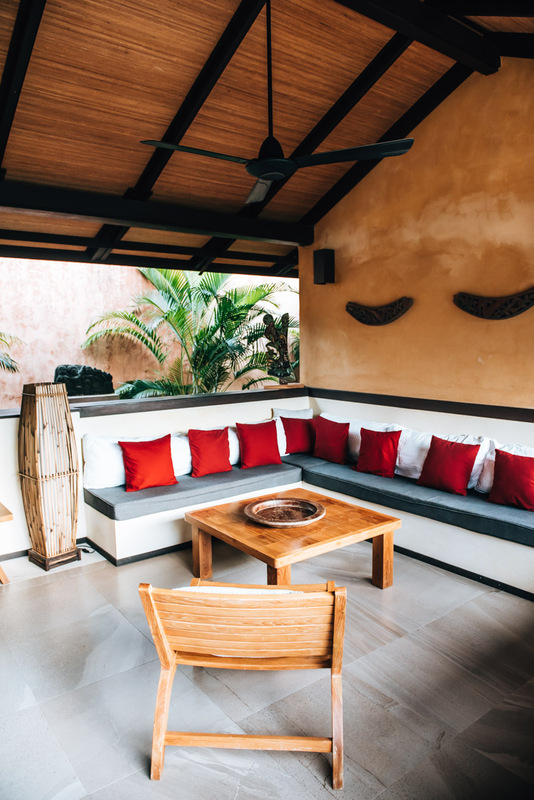 We had the feeling that families with children on Koh Lanta felt very at home, because it’s just a very comfortable island. The “best travel time” is always a bit of an issue in Thailand. Despite having a distinct rainy season and dry season, the weather can be quite random in between. 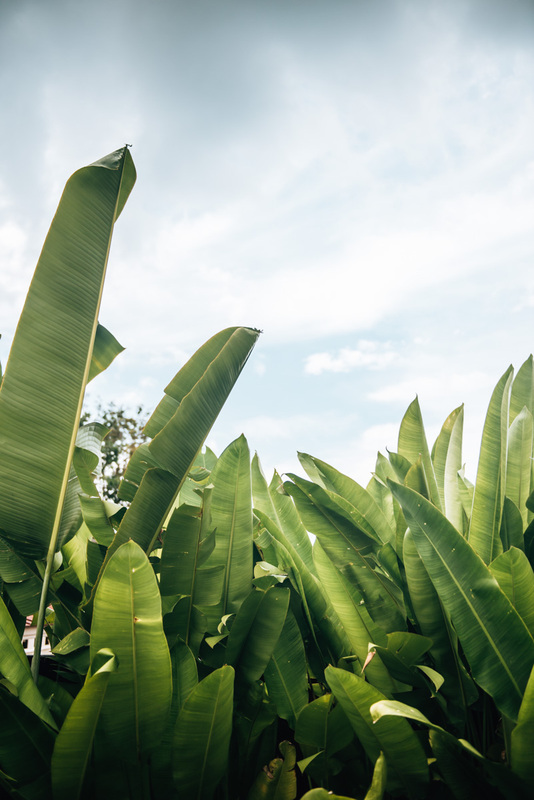 You might be lucky and catch a period of the rainy season where it isn’t actually that bad; whilst sometimes during the dry season, it can pour daily. 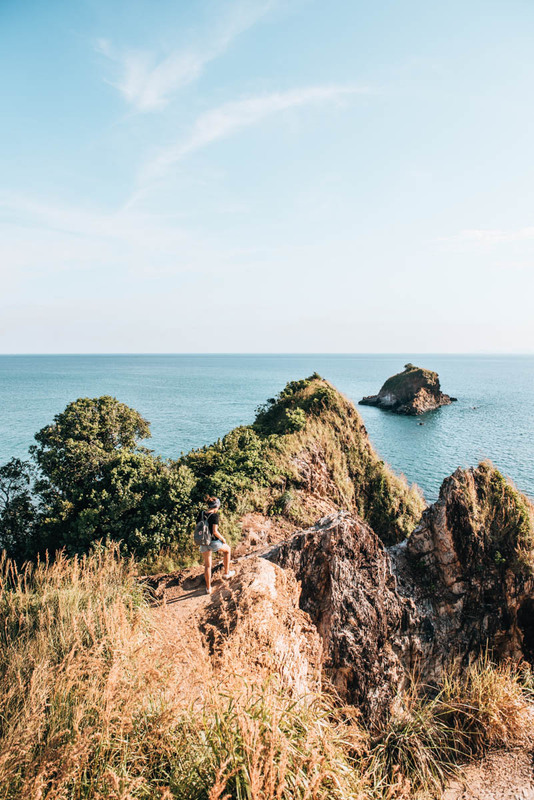 Unfortunately we experienced the latter: During our tip in January, which was the peak of the high season on Koh Lanta, it was theoretically the best time to travel as dry season goes from January to April. However, it rained almost every single day – sometimes several times a day and often torrential. Of course, this isn’t the norm – usually you can look forward to fairly stable, sunny weather and calm seas during this period. 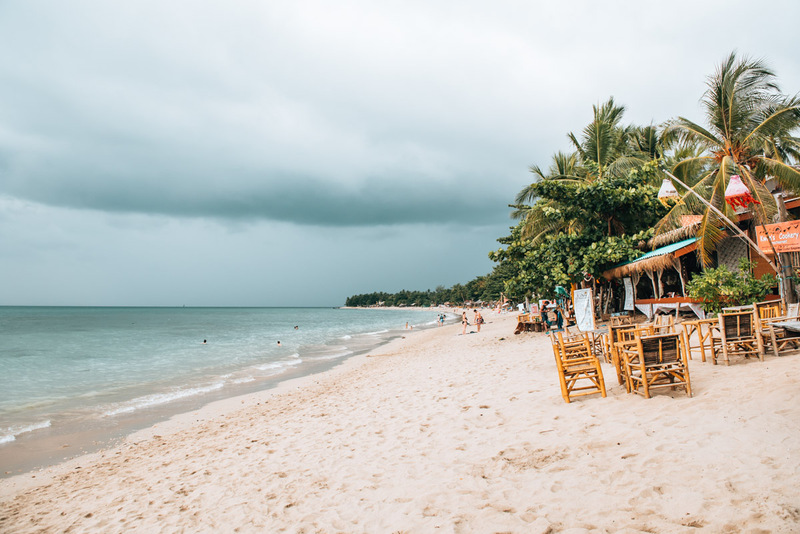 The rainy season on Koh Lanta is from May/June to September/October and during this time, the island experiences a noticeable drop in tourism. Some accommodation options even close during the rainy season as it’s just not profitable enough. The upside to this, however, is that prices fall rapidly to try attract more sales. The disadvantage is, of course, the very unstable weather. You can get anything from a few showers to continuous rain for days and everything in between. In addition, the sea becomes very rough during the rainy season, the beaches are neglected and left to accumulate a rather messy and dirty appearance. You should be fair warned that the rainy season on Koh Lanta is much more prominent than in other areas of Thailand. 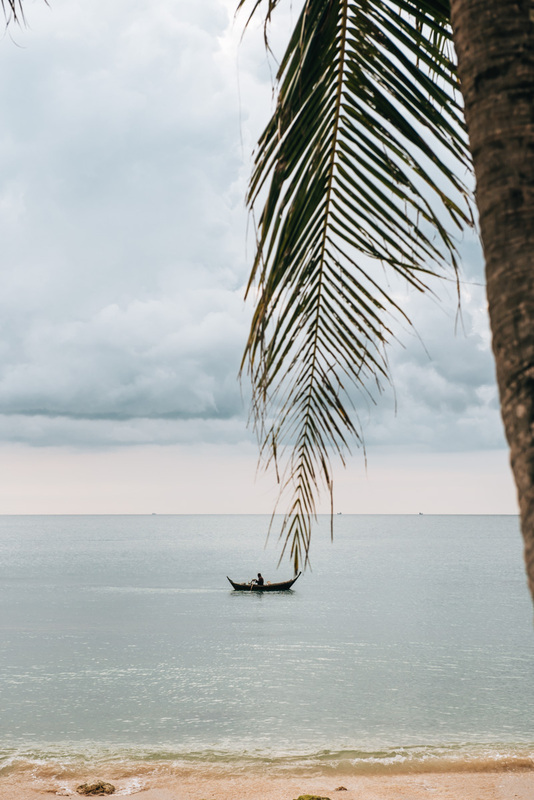 So if you’re planning on visiting, we would recommend you visit Koh Lanta outside of rainy season so you get the highest chances of good weather. January and February are the months with fewest rainfall and most sunshine hours. Probability of bad weather increases dramatically outside this period. 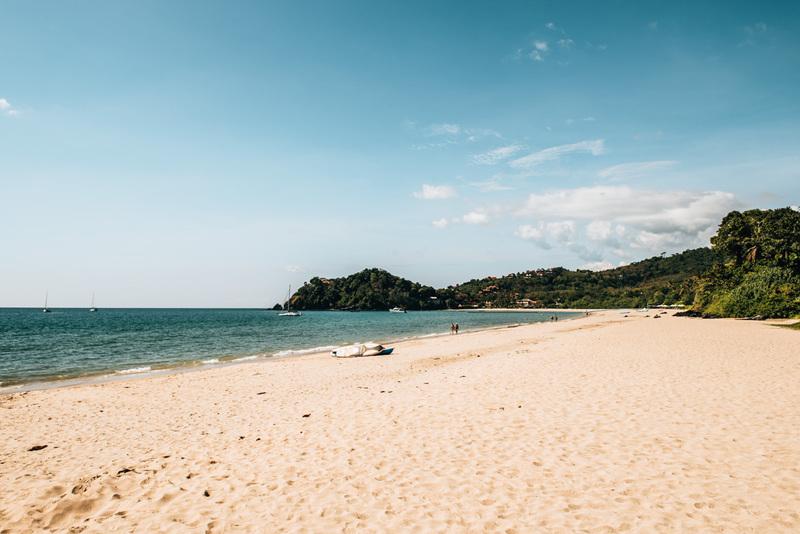 Beaches on Koh Lanta are all really nice but unfortunately, in terms of tropical-paradise beaches, we only found a few and this is mainly due to the surplus in predominantly longer beaches. While you might find small palm-lined bays, it doesn’t compare to that of Koh Phangan. All beaches on Koh Lanta are located along the west coast. So every night is a chance to see beautiful sunsets. The beaches in the north and in the middle of the island are particularly long, but the further south you go, the more beautiful the bays – some of which are quite secluded. We have rated all the beaches in a list from north to south for you below. The Long Beach (also called Haad Phra Ae) is the most famous beach on Koh Lanta. If you love long walks on the beach, then you will feel at home here. At more than 3 km long, this is the longest beach on the island. The beach is relatively flat and well lined with green vegetation, except most sections lacked the extra tropical feel of palm trees. 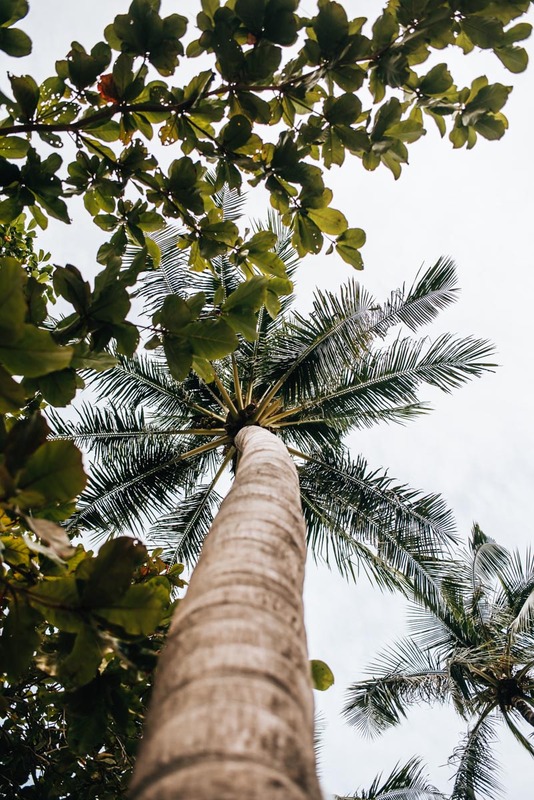 Conifers grew behind instead, but in our opinion, it just takes a few palm trees to transform an ordinary beach to a dreamy tropical paradise. Our visit in January saw very calm waters, great for swimming with some stoney sections under the surface. We read that, during the rainy season, this beach (as with most beaches in Koh Lanta) becomes rather neglected. Relax Bay is a little more hidden, located just south of Long Beach. We personally find bays to be more idyllic than long beaches, therefore we liked it better than Long Beach. However, this is our opinion and may not be the same case for you. 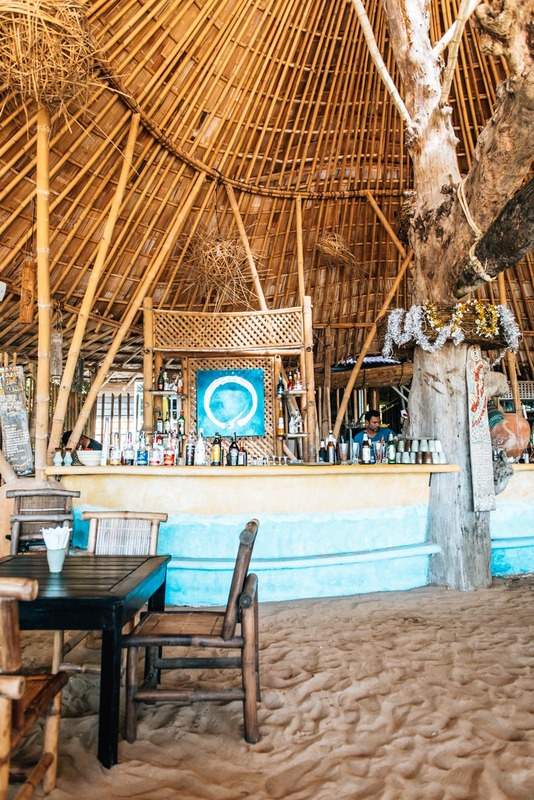 Lined with a few accommodation options, beach bars and massage cabins – this place has basically everything you need for a holiday on Koh Lanta and we particularly liked the cozy atmosphere here. During high tide, the swimming is fantastic, but when the tide goes back out, the stones can be quite uncomfortable to step on. The bay can be explored very quickly, so if you prefer long evening beach walks, we would recommend one of the other larger beaches. Our accommodation was close to Khlong Khong Beach, which is why we found ourselves there more than once. 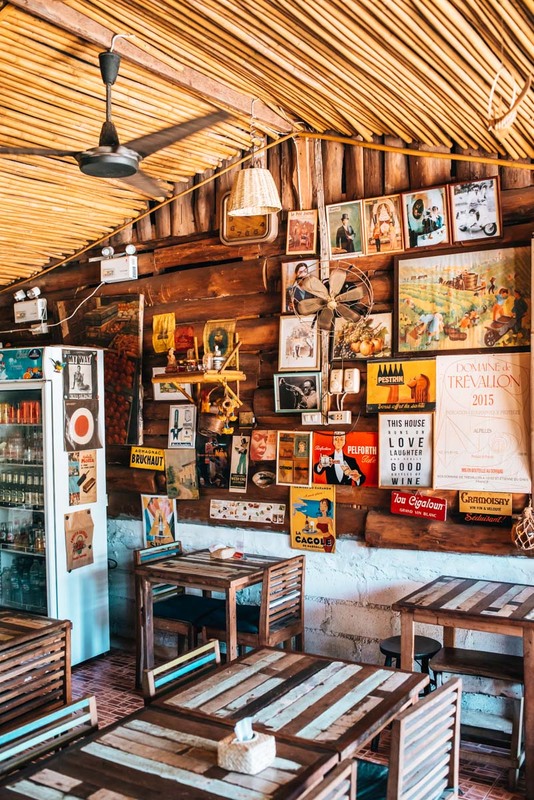 The Khlong Khong Beach has its own vibe and atmosphere with many Reggae bars and cheaper accommodation options can also be found here, hence attracting more of the younger crowd. Some bars offer “happy hour” in the evening, which is great for enjoying sunset right by the beach. You’ll also find regular beach parties here. Unfortunately, we found the sand was not as fine as on other beaches and had the feeling that a lot of coral gets washed up. 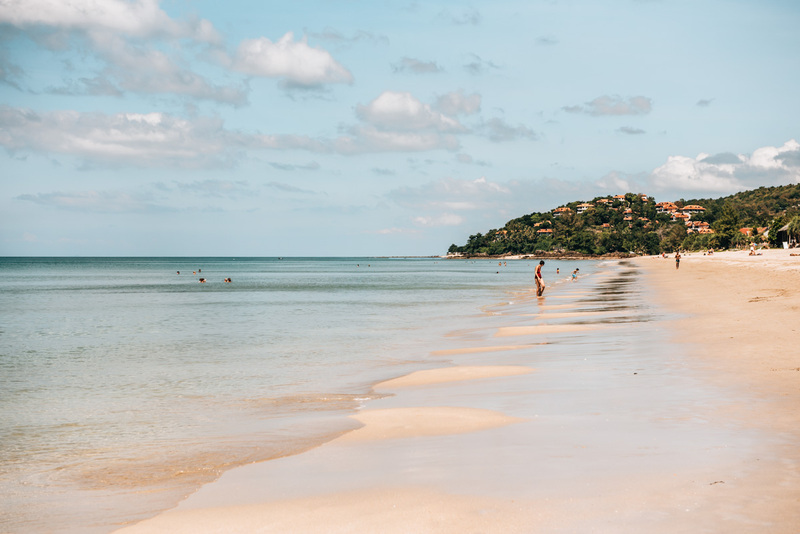 For swimming there are much more beautiful beaches on Koh Lanta, but if you prefer the more relaxed island atmosphere, then you will like it here! The Klong Nin Beach is another very long beach and we didn’t get to see all it had to offer. 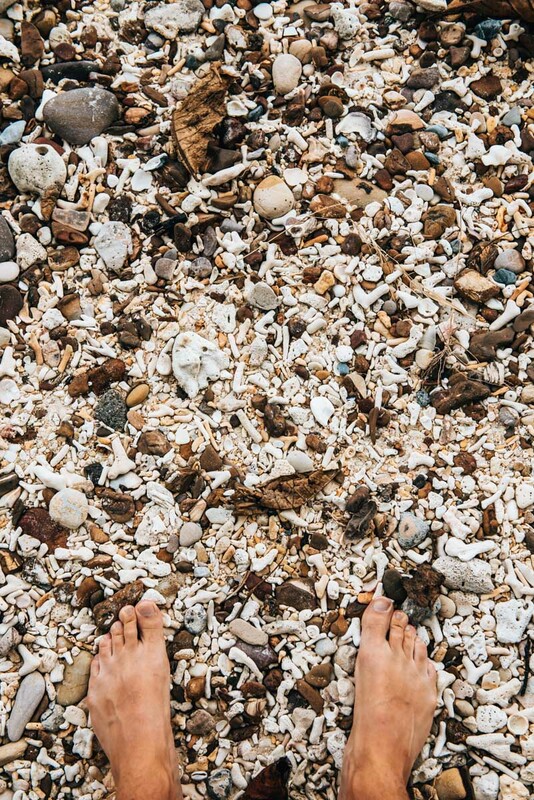 This beach resonated a little of the hippie vibes we found at Khlong Khong Beach. However, there are more accommodations here including resorts, situated right on the beach front. With regards to the swimming, we thought the beach was great! 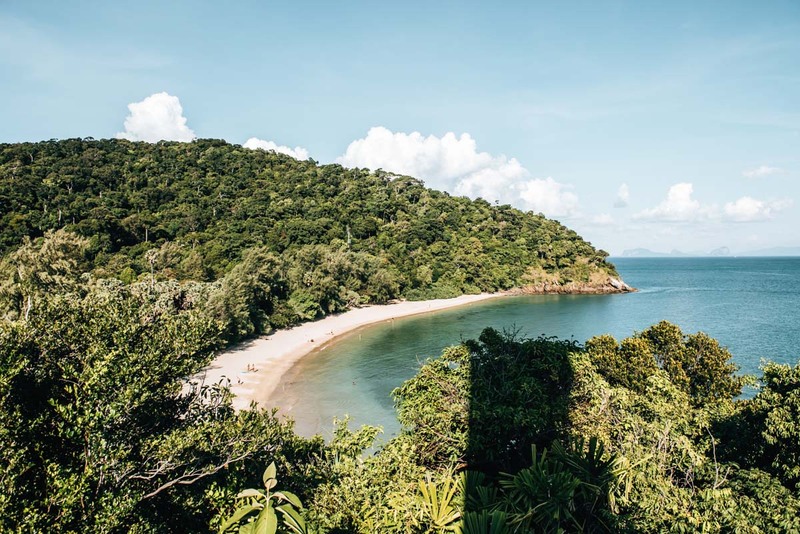 If you’re looking for peace and quiet on the island, then we recommend Nui Beach (not to be confused with “Nui Bay Beach”, which Google maps to the south of Koh Lanta). Even in high season, there is not much going on. The reason is that there is hardly any infrastructure: there is only one beach bar here and that’s about it. Unfortunately, it’s not possible to stay at Nui Beach, but it would make for a lovely day trip. This photo of Nui beach was actually taken from Diamond Cliff Restaurant, which has a small trail behind it, leading down to the beach. Ba Kan Tiang Bay is a beautiful bay and captured our attention from the first moment. Surrounded by lush hills, we found this bay an absolute paradise. No wonder luxury resorts like “Pimalai” chose this spot on the island. If you want to live luxuriously, then you’re in the right place. At low tide, the rocks might make it a little tricky to wade out into the water, but generally speaking, swimming is good here. 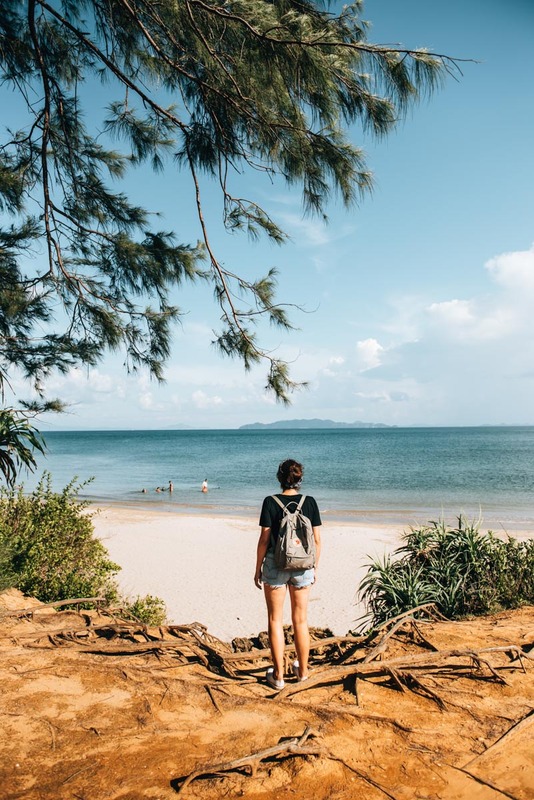 If we were to come back to this island in the future, we would definitely look at seeking accommodation here as we consider this to be one of the nicest beaches on Koh Lanta. 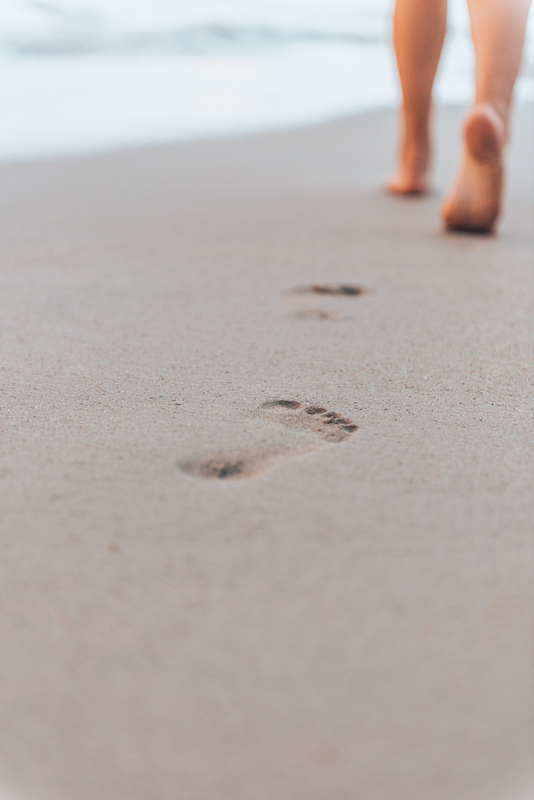 Something to be mindful of, is that there isn’t a whole lot to explore and discover, plus you won’t find those long beach walks here as the bay is cliff-bound both north and south. Just south of the National Park, lies some very rugged, crescent-shaped bays, including Bamboo Bay and Klong Jark Bay. We only saw the view from above and took some photos, so we cannot speak for the bays themselves as we didn’t actually go down to them. But we noticed that there wasn’t much going on in this region at all, despite being in the peak high season. So if you’re after secluded beaches, you’ll find your peace and quiet here. 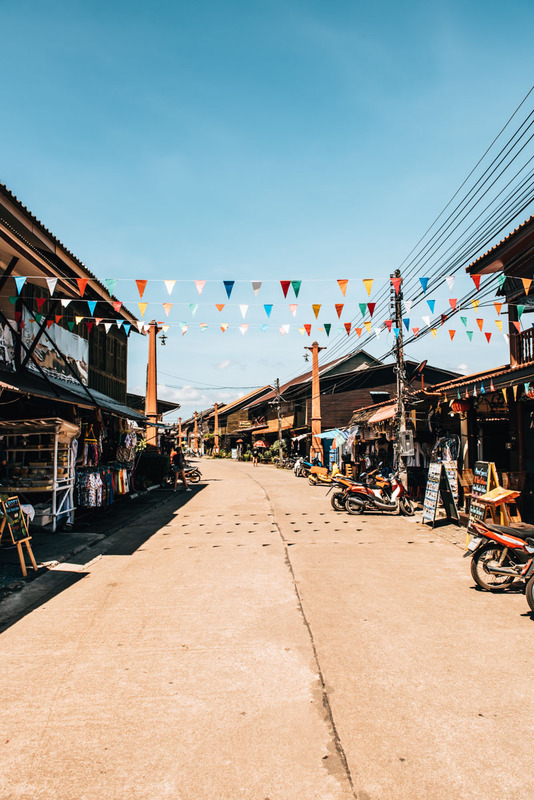 We were pleasantly surprised to find that Koh Lanta actually has an old town and a very pretty one indeed. The Old Town is a quiet street lined with shops and restaurants left and right, so if you want to buy a nice souvenir or dine with the sea view, then you’re in the right place. Koh Lanta Old Town is actually located in the otherwise secluded east of the island. To get there, you have to cross the backcountry lands, but don’t worry, it doesn’t take long and the road leads you through some stunning scenery. 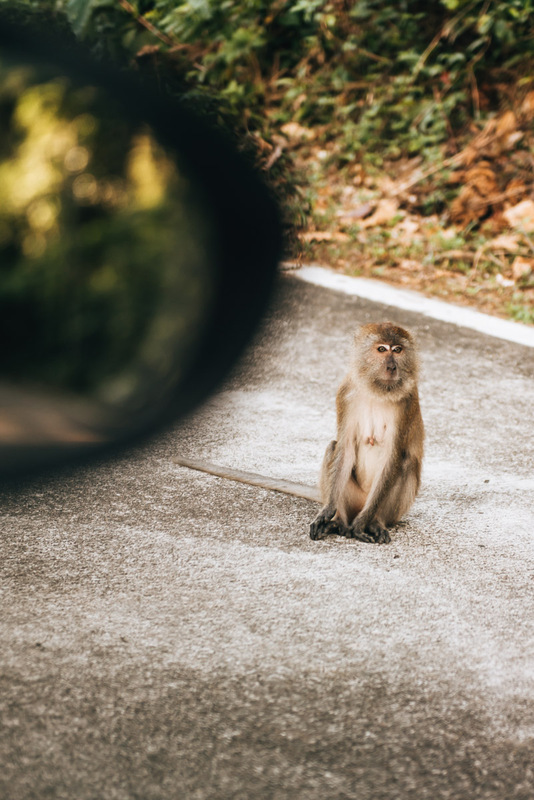 Tips for scootering and driving on Koh Lanta can be found at the end of the article – or you can always rent a tuk tuk. One of the places you absolutely cannot miss while on the island, is the National Park located in the south. The southern region of Koh Lanta was easily our favourite and the National Park was rather easy to navigate. Hands down one of the most beautiful spots on the island. You can park the scooter right at the entrance and explore the national park by foot. With just two beaches, a sandy beach and a rocky pebble beach, the National Park is not very large, so we found that swimming was only suitable on the (really beautiful) sandy beach. We’d recommend taking a short walk via the path to the lighthouse, which is located on the cliffs. From there you have a great panoramic view over the bays and ocean. Admission: 200 baht per person; 20 baht parking fee for the scooter. Tip: beware of the very boisterous and aggressive monkeys! Those in the National Park are very used to humans and get uncomfortably close. So never open your bag when a monkey is nearby, as they think you have something edible – and never leave your bag unattended! We couldn’t make up our minds, whether or not we should do this tour. The reason for our hesitation was the fact that this was probably the most popular day trip offered in Koh Lanta. It’s an excursion out to four small offshore islands and we were skeptical that it might just be one of those tourist traps, but in the end we decided to go through with it. 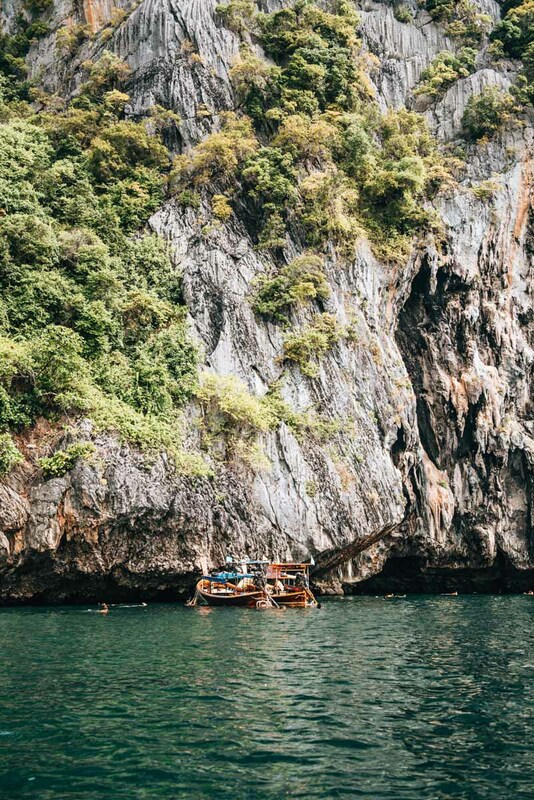 The deciding factor was ultimately the well photographed and very hyped up highlight of the tour: The Emerald Cave, located on the island of Koh Mook. Here, you swim through a cave about fifty meters long before you land in a tiny cove surrounded on all sides by rock walls. It felt like we were in the scene of the movie “The Beach”, it was so surreal that the atmosphere is hard to describe in a coherent string of words. However, now comes the not so good news. We want to be honest with you so the real truth is that this magical haven is tragically overcrowded. In front of us was a Chinese tour group, behind was the next group already itching to get their photos. If you are good at mentally blocking out large crowds, you will love it. If not, you’ll be sourly disappointed. Fortunately, on the other islands, mass tourism was better distributed. We were given a relatively generous amount of time for snorkelling on Koh Chuek. However, the snorkelling experience didn’t live up to expectations as seems to be the case in most parts of Southeast Asia. The tour to the 4 Islands is usually between 8am-4pm, with varying times depending on the tour company. 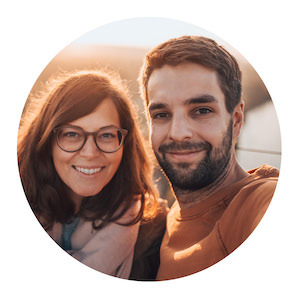 Most likely, you’ll be picked up from your accommodation by an open taxi, taken to the pier and dropped back off at your accommodation in the late afternoon. There are two boat options: You can choose to experience the tour either by speed boat or with a long tail boat. Both involve sharing the space with a large crowd, but the speed boat seems to be comparatively more crowded. We tried our luck, negotiating a fair price for a private boat tour, however to no avail. It would’ve been much more ideal to have had our own individual tour so that we wouldn’t feel rushed and cramped. In the end, we decided on the slower and much cheaper long tail boat. We paid 700 baht per person, which includes the transport to and from our accommodation, lunch, fruits and drinks on the boat. Lunch was packed and taken with us in large boxes from Koh Lanta so it was rather lukewarm by the time it was served. To be honest, we had higher hopes for lunch. All in all, you’ll notice from the start how extremely touristic the tour is. 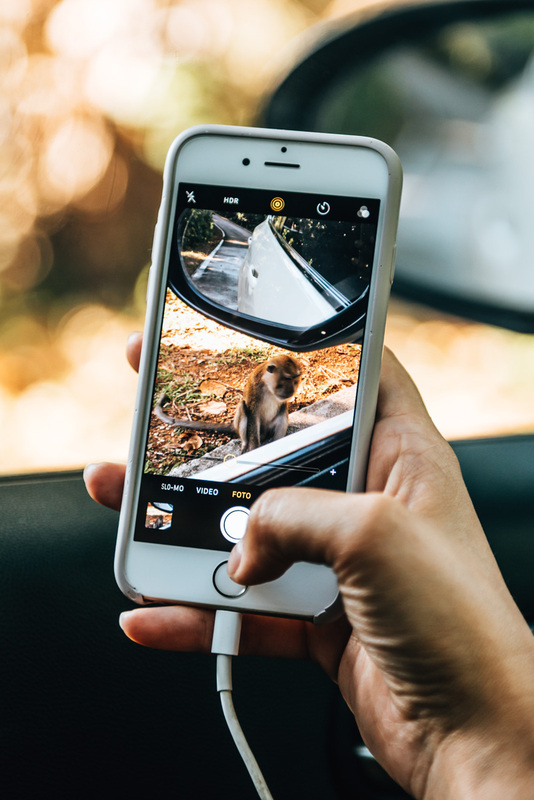 On a side note, to help you take pictures at the Emerald Cave, the guides usually collect and transport the cell phones and cameras in a dry bag. If you have your own dry bag, then take it with you! Would we recommend the tour? Yes and no. If you have an extra few days on Koh Lanta and you definitely want to do a day trip, then it’s worth it. The Emerald Cave is seriously gigantic. 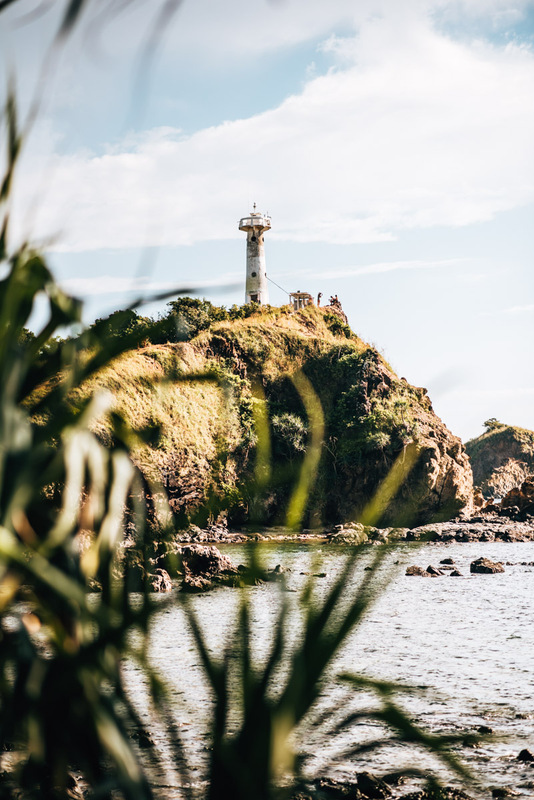 However, if you are aware of what these day trips entail and would rather avoid tourist crowds, as you only have a few days, then you’re better off exploring the island instead! 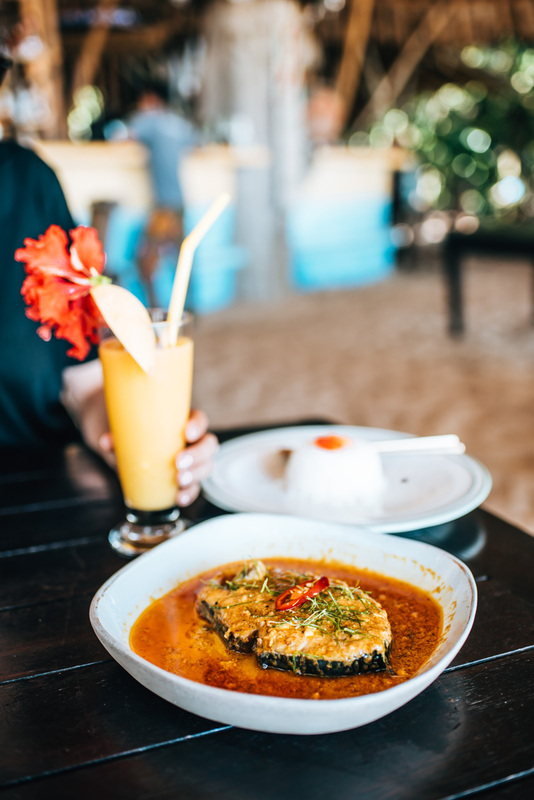 There are countless restaurants on Koh Lanta and depending on which beach you’re on, finding your go-to place should be pretty easy. Nevertheless, we’re still going to share some special cafes and restaurants with you. 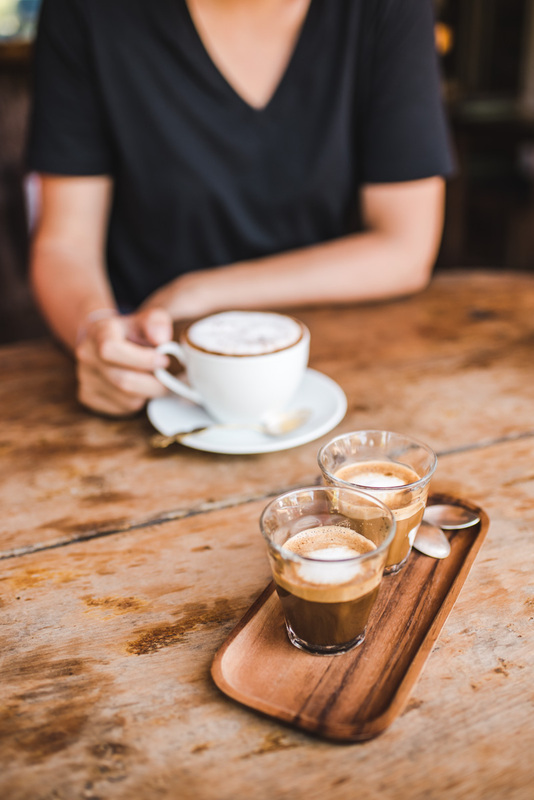 We stopped at Shanti Shanti, which is located in Khlong Nin, for a quick coffee break. They have three locations on the island: We went to the one on the main street of Khlong Nin. In addition, there is the Shanti Shanti Beach House (also in Khlong Nin) and now a restaurant in the Old Town. Since we were there in the afternoon, we felt that an espresso macchiato (60 baht) & nutella crepe (120 baht) was well suited. Both were really delicious! The Shanti Shanti is run by a Frenchman, so the menu is French inspired. Speaking of the menu, the main dishes in Shanti Shanti are said to be very good. We’ll be sure to test that next time we’re back. You’re probably already thinking how unimaginative the name is… but bear with us, as the location is much more promising. 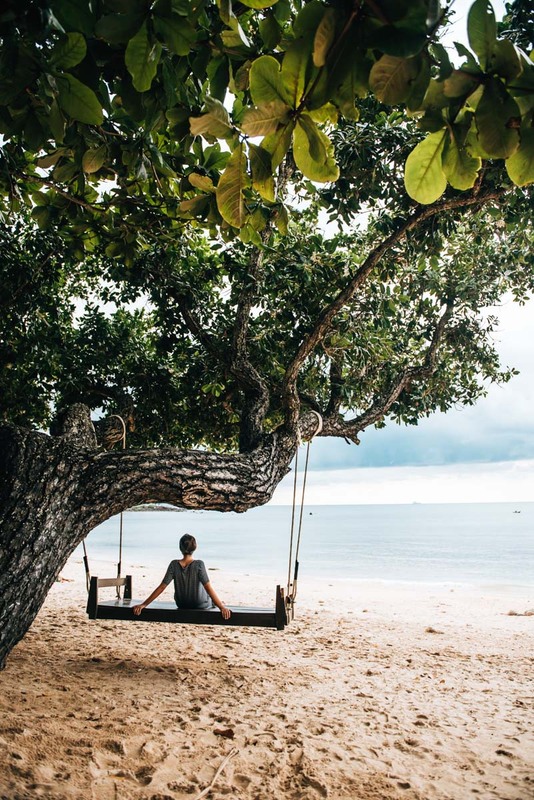 Located directly on the beach in a bay called Ba Kan Tiang Bay, we found you could sit here with your feet in the sand, which is not uncommon for Thailand, but still, we always find a slight thrill in doing so. We came here for lunch and was blown away by the kitchen! We ordered three dishes in total, all of which tasted amazing. The prices however, were up in the pricier segment. For example, the fish curry in the photo cost 220 baht. 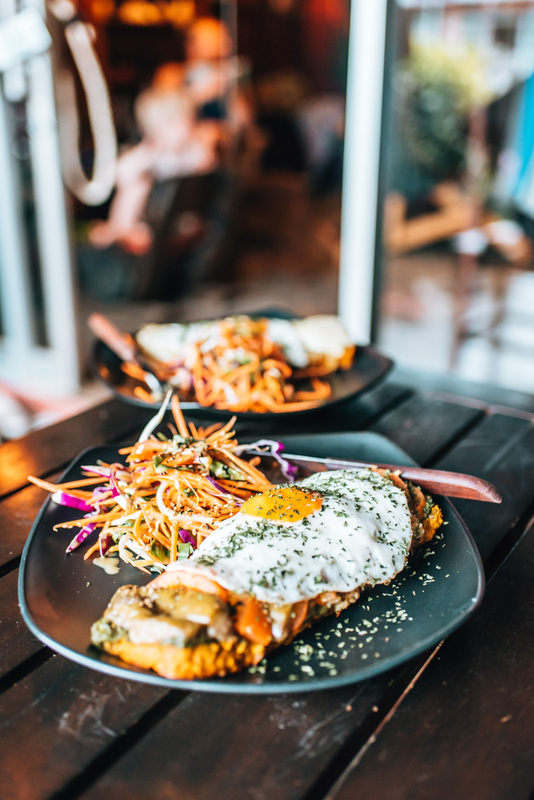 Our favourite dish and the one we would highly recommend is the Egg Plant Salad – it was excellent! To all you vegetarians and vegans, we can’t recommend this place enough! Interestingly enough, the menu has nothing to do with Thai food. Instead they serve fusion cuisine, including a variety of sandwiches, which you can see in our photo. Mixing things up can be a good thing, right? 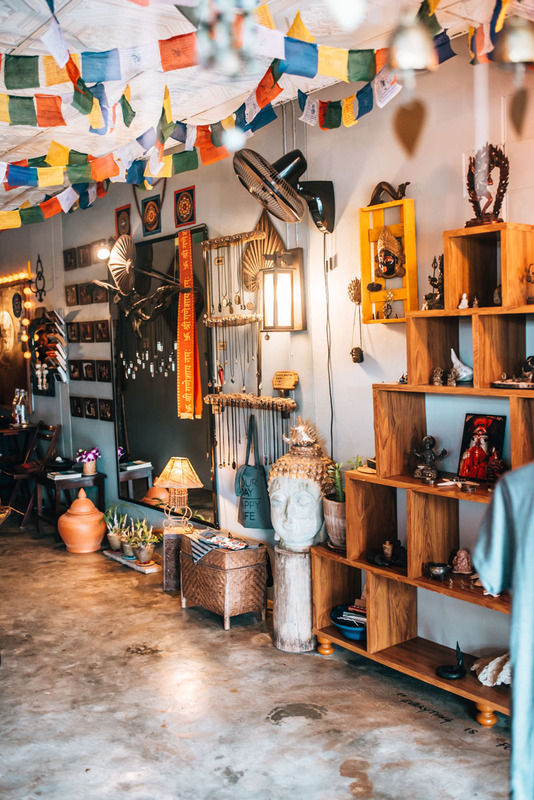 Whether or not you’ll like the yoga-hippie atmosphere depends on personal taste. We felt very comfortable here, but as expected, the prices are way above average, with the bread (as shown in the photo) costing 210 baht, minimum. 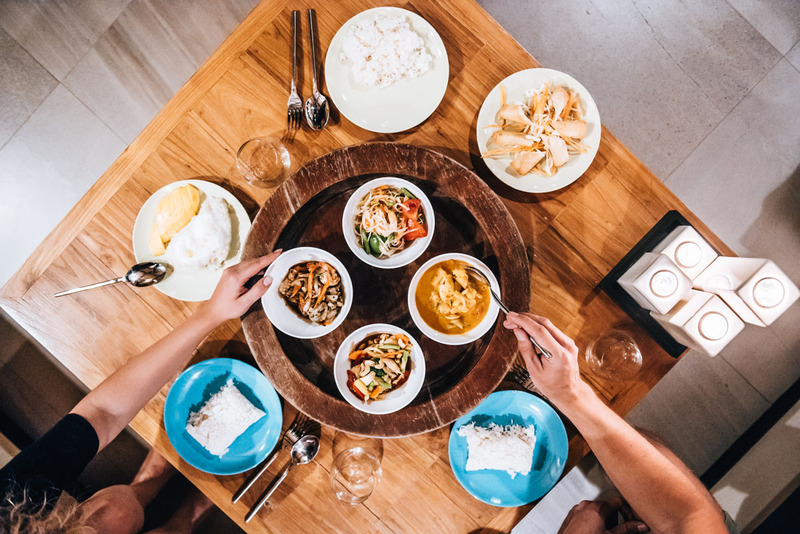 We would recommend the restaurant if you’re looking for creative vegetarian cuisine away from Pad Thai & Co.
On Koh Lanta, we really treated ourselves and we rented this beautiful stunning villa with a private pool for one full week out of the three were were there. Was the villa out of our budget? Far out, yes! Was it worth it? Are you kidding? We still talk about it to this day! 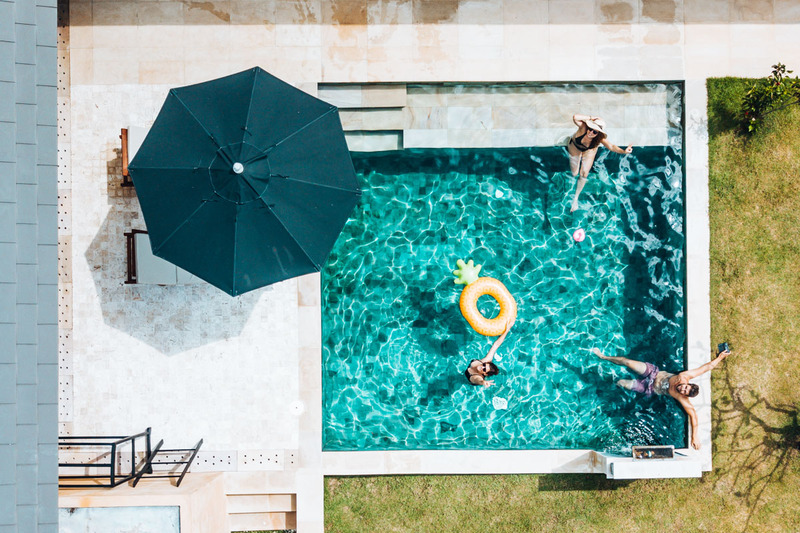 Alanta Villa refers to itself as a little paradise and the complex hosts several villas, each with two or three bedrooms. Kitchen and living area are in the covered outdoor area, which gives the whole thing a very special, tropical vibe. Occasionally you may come across passing visitors like frogs, who might stop by and say hello! The bathroom is a beautiful outdoor oases, the beds super comfortable and the air conditioning in good condition. The highlight is, of course, the beautiful private pool, which is very well maintained. It’s very rare for us to find it so difficult to pull ourselves away from our accommodation during the day, in order to explore. We did manage to make our way down to the beach more than once, but something you should know, is that the Alanta Villa is located on a small hill in the backcountry and the Khlong Khong beach is actually a good 5mins walk away. Daily breakfast can be ordered and served for an extra price but we took care of ourselves with some quick snacks. On our last evening, when we unsurprisingly wanted to stay in and make the most of our remaining time in our little paradise, we indulged in the luxury of having our food delivered directly to the villa. The food is prepared in the nearby restaurant “Lucky Tree”, which we highly recommend as all the food was just delicious. A fantastic way to end our trip. Staying in one place for an entire trip is out of the question for us. There exists a constant itch to go out and explore as much as we can. If you feel the same, then we’d strongly recommend you organise your own mode of transport on Koh Lanta so that you have that extra freedom. Like almost everywhere in Thailand you can hire a scooter, which is also the cheapest option: For one day (24 hours) it costs about 200-250 Baht. Driving a scooter on Koh Lanta is relatively easy because there is little traffic on the roads. If you also want to explore the south, then you should take into consideration the rather steep roads. If you’re not comfortable with scooters or if you have a larger group, (maybe a family with kids) then renting a car makes more sense. We almost always opt for scooters, but on Koh Lanta we rented a car for the first time in Thailand. We paid 1200 baht per day (or 24 hours), which also includes liability insurance – unlike the scooter rental. However, the question is: to what extent are you covered in case of an accident? On Koh Lanta, like all of Thailand, left-hand traffic prevails. We found that you adapt relatively quickly, however, you should always drive with extra care and caution if you are not used to it. Alternatively, you can also get around with tuk tuks from A to B. For a shorter distance expect about 100 baht, but you can definitely barter the price down in your negotiations and do so before the driver starts. Koh Lanta does not have an airport, so you have to travel by ferry from the mainland, which is not a big deal as they’re very close together. The nearest airport to Koh Lanta is Krabi. From there you usually go by car or minibus south to the point across from Koh Lanta before getting a transfer to the island. 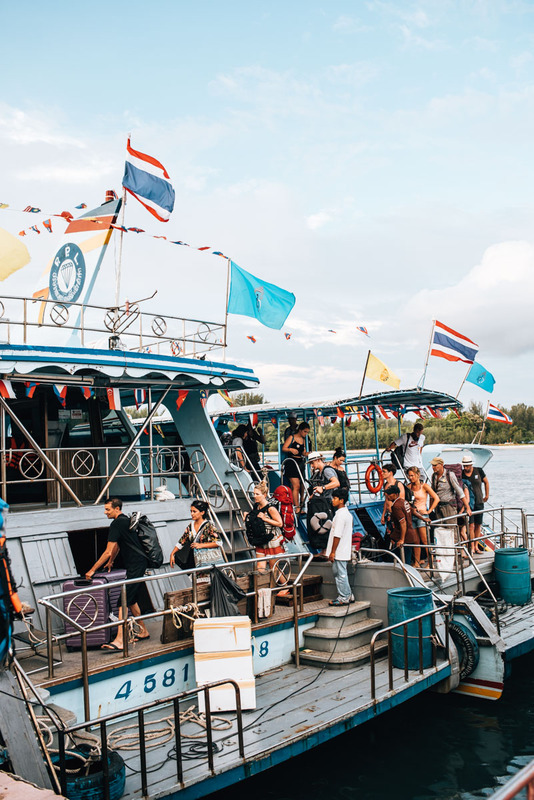 A car-ferry runs between the mainland and Koh Lanta with two destinations: one goes to Koh Lanta Noi and the other goes between the two islands of Koh Lanta Noi and Yai. None of the ferries actually have fixed times for departure, instead they run non-stop from 6am-10pm. It only takes a few minutes to reach your destination. The easiest way to get there is to arrange transportation from Krabi Airport to Koh Lanta directly from your accommodation on Koh Lanta. For such a private shuttle, however, they usually ask for a handsome sum. You can of course, also book a minivan transport to Koh Lanta directly at the airport or in Krabi. 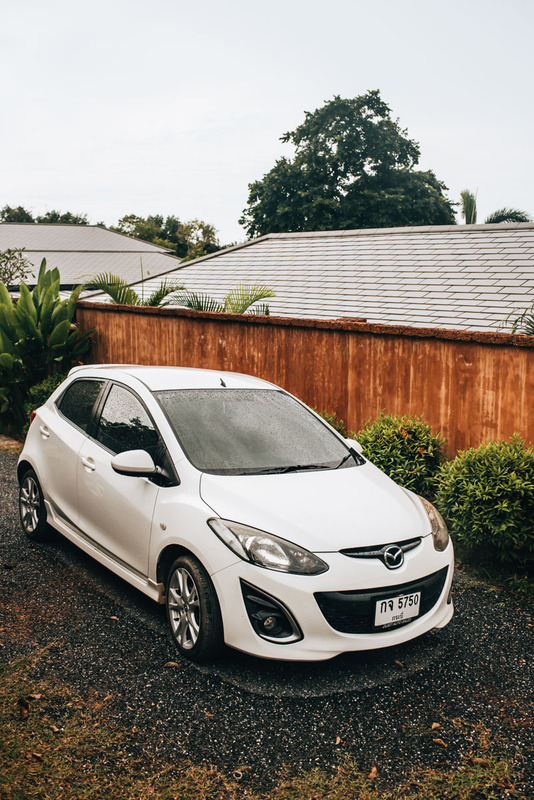 It should cost about 400 baht, but make sure you are brought directly to your accommodation on Koh Lanta because if they drop you off at the pier in the north of the island, then you’ll have to fork out extra money for unnecessary transport inconvenience. The minivan journey takes about 2.5 hours and we only paid 300 baht for return transport between Koh Lanta and Krabi Airport. It seems bartering is very promising and useful here. For example, if you are in Ao Nang (Krabi Province) and you are already near the harbour, then it’s worth travelling the entire distance to Koh Lanta by boat. We paid 450 Baht for the trip, including transportation from our accommodation in Ao Nang to the pier. Our trip ended at the harbour on Koh Lanta. From there we took a tuk tuk to our accommodation. 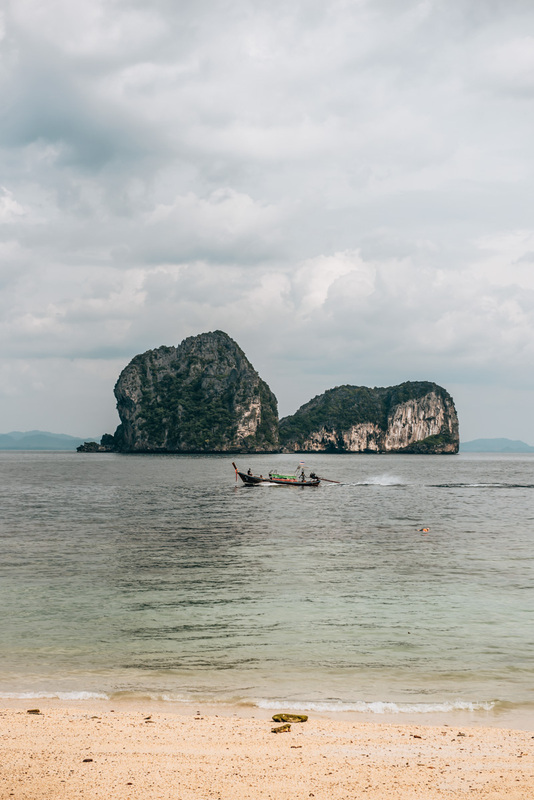 If you want to travel from Bangkok to Koh Lanta, then we would recommend you book a flight to Krabi and then travel with the car ferry from there as described above. With a bit of luck, you can find very cheap flights with airlines like Air Asia. Transparency: This blog article contains our personal recommendations in the form of so-called affiliate links. If you book or buy something via the links, we will get a small commission. For you, this does not change the price. Thanks a million from the both of us! 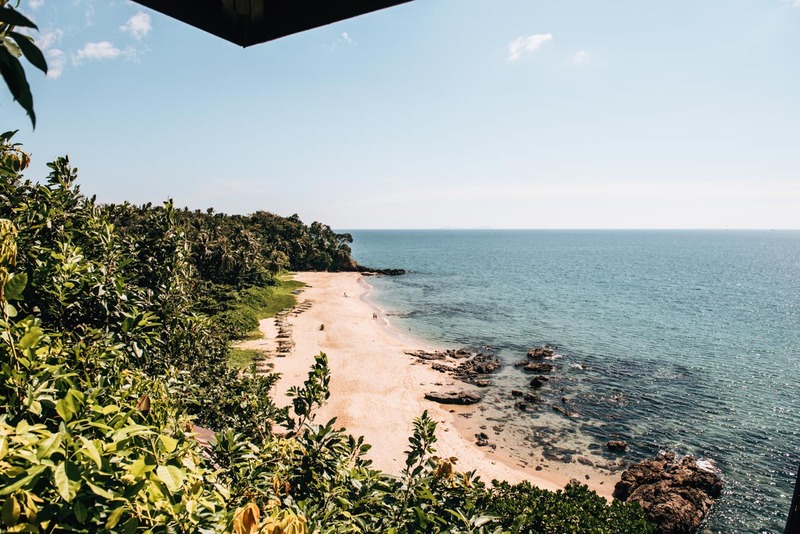 Have you been to Koh Lanta before? How did you like it? Or are you planning a holiday to Koh Lanta? If you have any questions, just ask away! We look forward to your comment! Hi, I just returned from Koh Lanta. Your blog is one of the best. Enjoyed it! Thanks! Hi, we are 4 friends traveling to Thailand on 23 August. We only have 7 nights to spend on an Island. We will arrive late in Bangkok and then depart for the island the next morning. Initially we wanted to go to Koh Lipe but after a lot of reading I am worried that the travel will be too long and complicated given it is low season. So, we are thinking that Koh Lanta might be easier. We love the beach during the day – nice sandy beach with clear water (or at least good water conditions), and restaurants at night. We aren’t crazy about backpacker places. Do you think Koh Lanta is a good option or do you recommend a different island? thanks for your message. We wouldn’t suggest to spend August in Koh Lanta. It’s rainy season and the island is usually veeeery quiet. Some hotels are closed. What about Koh Phangan? Summer is usually pretty fine there even though it’s rainy season. There are severel direct flights from Bangkok to Koh Samui. There are regular ferry services operating between a Koh Samui and Koh Phangan.